Get it out first. You may have heard the song “Shake Your Sillies Out.” It’s not just a cute kids’ song. This concept can work for kids of any age. Teach your child to release some of that pent up energy before getting ready to do homework. Once that burst of energy is released it will make it much easier to concentrate. Turn off technology. I know … the horror! It’s very difficult to be tuned in to your homework when you’re too busy being tuned in to something else. Before any major homework or study session, have your kids turn off the television, shut down the computer and put their phones away. Create structure. 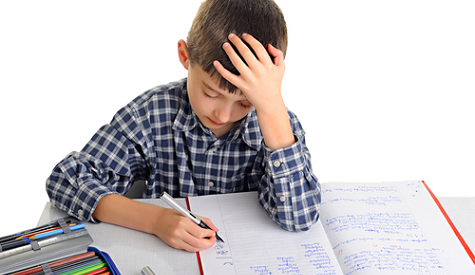 Students who are prone to distractions do best when they have some sort of structure or routine to follow. Establish clear rules for study times and have consequences for when the rules are broken. The consequences you choose are up to you, but pick something that is appropriate for your child. Some children do better with natural consequences while others learn better when the consequences are imposed on them. Give rewards. Teaching your child self-discipline is not all about consequences; it’s also about rewards. Like consequences, rewards should be appropriate. Younger children do well with sticker charts and prizes. Older children and teenagers may earn extra privileges. Be a model student. Kids learn the best by watching what their parents do, so practice what you preach. If you choose to watch TV or play games on your smart phone instead of taking care of your responsibilities, your kids will pick up on those habits. Model ideal behavior by showing your kids that you can stay on task and get your tasks down before having free time. Get outside help. Sometimes, we can't do it all. That's where an academic private tutor in Chicago can come in. A tutor will work one-on-one with your child and help him learn strategies that will help him stay focused on learning. Learning self-discipline and how to be a model student is not something that can be taught overnight. It is a process that can take years to refine. Start young, use age-appropriate strategies and take it one step at a time. Eventually, your child will need less coaching and will be able to focus and learn like a pro. We can help your child create the proper habits, organization and time management skills to achieve greater accomplishments. Contact Chicago Academic at 773-466-0101 to learn more about our programs.